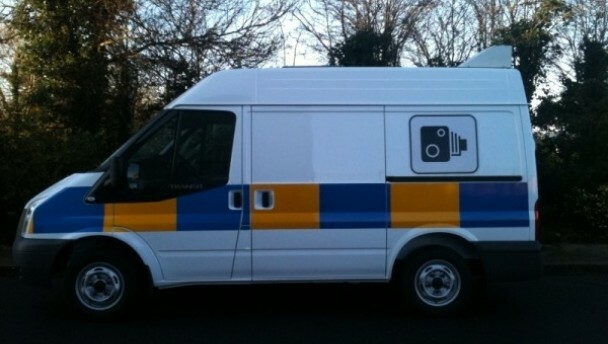 By now no doubt you will all be familiar with the presence of the mobile speed camera on our roads officially called safety cameras. Introduced in late 2010 by An Garda Siochana, they are located generally at various road spots across the country, so the chances are that you will meet one at least once a day on your daily commute. They are operated by trained personnel and their primary aim is to save lives on our roads, by their observance of speed undertaken by Drivers, recognising that inappropriate speed is a major factor in road traffic accidents. Speeding is a driving offence and as such it carries with it penalty points. We are allowed a maximum of twelve penalty points on our licence before being disqualified from driving for a period of six months. The speed camera in the van can detect the level of speed of a motorist. If the speed that the motorist is driving at exceeds the level of speed for the designated road it will be detected by the camera. Once that occurs, a Fixed Charge Notice otherwise known as a fine is sent by post to the registered owner of the vehicle. This is issued from an office in Thurles in Co. Tipperary. It is a system that allows a motorist who has been detected of a speeding offence to pay the fixed charge or fine as an alternate to going to Court to answer the driving offence. Once you receive this notice in the post you have a period of twenty eight days within which to pay the fine to the office in Thurles. The fine for a speeding offence is €80.00 but it also carries with it two penalty points that are recorded on your driving licence record with the Department of Transport. Penalty points stay on your licence for 36 months. If you fail to pay the fine within the twenty eight day period you face an increased fine of €120.00 to pay within 56 days of the offence having been committed. If at the end of the 56 days you still have not paid the fine, Court proceedings at District Court level will be initiated. This means that you will receive a Summons in the post to appear before the local Court of where the offence occurs. At that stage, you are obliged to attend Court and to explain the reason as to why you did not pay the Fine and why you were speeding. You may have a Defence to the charge against you, but assuming that you are guilty of the offence, it goes without saying that you have a more expensive cost to pay at Court level. Judge McNulty the local District Judge for West Cork has the jurisdiction to fine someone up to €800.00 and can also make other Orders. However, if the circumstances are straight forward, and it is a first Offence, the fine is usually not near as high as that and is usually much lower. Additionally, the penalty points double on your Driving Licence record from 2 points to 4 points and you get a conviction recorded against you for a driving offence. Although the above penalties may seem harsh on the face of it, it must be acknowledged that the objective of the speed camera is to save lives and is not related to revenue collection. That is precisely why the camera is mainly located in areas that have speed related collisions and are of a type where there is a higher than expected frequency of collisions likely to occur. At the end of the day, the objective of the speed cameras is right and for this objective to achieve its aim, cooperation of the community is required even if none of us would like to get caught on it!